A cute guest has come to League of Angels II now! Battle Squirrel, is a powerful artifact mount which lives in forest for decades. Since his hibernation is over and it's spring now, he comes out to seek a warriors to join in his journey. Battle Squirrel will show up in upcoming Angels Fortune from Mar. 23rd to Mar. 25th. Let's know more about the new mount. 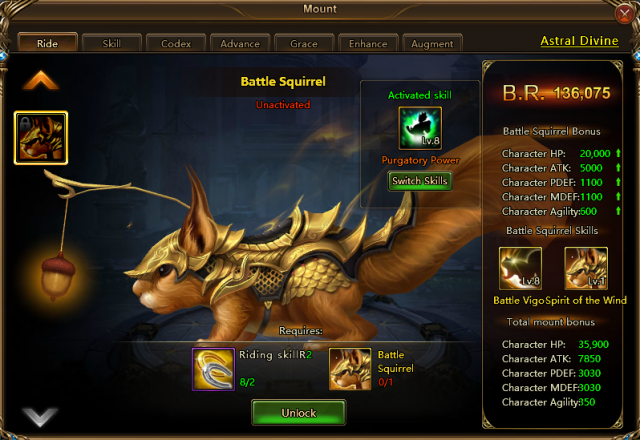 Battle Squirrel is an Artifact Grade mount. His Grace skill Spirit of the Wind can increase your Rage and reduce the Dodge and DEF of all enemies which will help you greatly in battle. Increase Agility, HP, and Hit of the entire squad by 26.25% for 5 turns. At the start of battle, increase your Rage by 300 and reduce the Dodge and DEF of all enemies by 15% for 2 turns; this effect ignores immunities and cannot be dispelled. Participate in the upcoming Angel's Fortune event from Mar. 23rd to Mar. 25th and you'll get the chance to ride powerful new mount Battle Squirrel! Stay tuned for more great content coming to League of Angels II. Next：New Clothing Jade Blossom: Dress Up for St. Patrick's Day!